In 1948, a mysterious and charismatic man arrives in a small Virginia town carrying two suitcases - one contains his worldly possessions, the other is full of money. He soon inserts himself into the town's daily life, taking a job in the local butcher shop and befriending the owner and his wife and their son. But the passion that develops between the man and the wife of the town's wealthiest citizen sets in motion a series of events that not only upset the quiet town but threaten to destroy both him and the woman. If I had kept track of my favorite reads of the year in 2009, Goolrick's A Reliable Wife (my review) would have been on it. Goolrick had the capability to make the bitter cold of rural Wisconsin cool a torrid Nebraska summer day and convince me to care about some very unlikable characters. When Heading Out To Wonderful was released, I didn't hesitate to pick up a copy. But when I began reading less than glowing reviews, I found Wonderful getting pushed aside again and again in favor of other books. Eventually it was the victim of a book cull. Still, when I found an audiobook copy for $2 at my library book sale, I decided to give it a try. After all, not all of the reviews had been bad, including this fantastic review from Jill at Rhapsody In Books Weblog. If Jill likes a book, there's a good chance I'm going to like it, too. I'm glad I didn't give up on this one but even happier that I waited to "read" it until I could listen to it. Norman Dietz's reading is marvelous. His mellifluous voice reading me very much of listening to Garrison Keillor telling a story and perfectly suited the setting of the book. 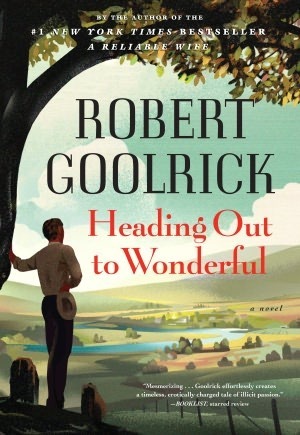 In Heading Out To Wonderful, Goolrick lulls readers with the quiet, peaceful setting of small-town Virginia, the kind of town "where no crime had ever been committed," just after the second World War. The people of Brownsburg "believed in God and The Book." There is a real sense of community in Brownsburg. Still, it's not all as wonderful as it seems on the surface when Charlie Beale arrives in town. Surprisingly, the town quickly grows to love Charlie, a man who is kind and giving to everyone. So when word gets out that Charlie has taken up with the wife of the richest man in town, a man no one likes, they are happy for him. Until the scandal takes a new turn. I liked the way Goolrick slowly built up the tension (you just know that this is not going to end well), the way that he called out racism and the hypocrisy of organized religions, and the way we got the back story on so many of the important characters. And that ending completely stunned me. But, like A Reliable Wife, Heading Out To Wonderful, has its flaws. We never get Charlie's back story. Where did he come from, why is he working so hard to find a permanent home, and where did all of that money come from? And, if the young boy that Charlie becomes so attached to is actually telling the story looking back 60 years, how does he know everything that happened in people's history or the things he was never privy to? As to that later point, it wasn't one that bothered me throughout because I was so into the book as I was listening. Like Reliable Wife, there are also passages in this book where Goolrick drags things out too long, particularly when he's talking about Charlie's feelings about the woman with whom he's having the affair and their relationship. The beauty of listening to a book, when it comes to places like this in a book, is that I can sort of just tune out until things pick up again. Would it make a good book club choice? Yes. There is certainly a lot to discuss, including religion, racism, small town ethics, adultery, parenting, the class divisions. It's not a perfect book; but, especially on audio, it's worth reading. I liked A Reliable Wife enough but not enough to pick up his other book, I guess. Right now I am reading The Perfect Mother and it totally sucked me in but now it's getting stupid. I hope it doesn't stay stupid. I always pause before picking up a book that includes adultery. It's not my favorite subject to read about. I don't think this is something I would like right now, but perhaps down the road. I like books that I can chew on. Looks like this is one of those books. Great review as always!